Five Guantánamo prisoners transferred to Kazakhstan. U.S. military guards move a detainee inside the Guantánamo detention center. The U.S. transferred five more detainees out of Guantánamo, the Defense Department announced late on Tuesday evening. The prisoners—three Yemenis and two Tunisians—were sent to Kazakhstan where, administration officials tell the New York Times, they are essentially free after more than a decade at the military prison. “Officials declined to disclose the security assurances reached between the United States and Kazakhstan or detail how the men would be prevented from returning to battlefields in Afghanistan or Pakistan,” according to the Times. “All five men were cleared in 2009 by a national security task force that President Barack Obama had assembled upon taking office to examine the captives’ files,” the Miami Herald reports. “None had ever been charged with a crime at Guantánamo.” The latest move increases the number of prisoners transferred out of the prison to 28 as President Obama tries to accomplish his long-promised goal of closing the facility. 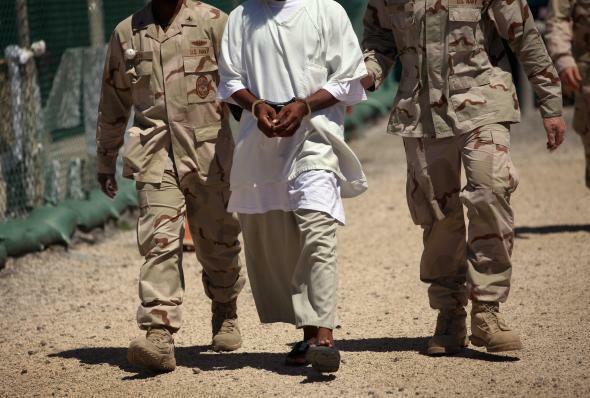 The detainee population at Guantánamo now stands at 127, according to Reuters. More than half of the remaining prisoners are Yemeni, but have not been transferred because of the unstable security situation in Yemen.